California’s microbrewery scene is one of the best in the country. San Diego leads the way, but many of California’s cities and towns have microbreweries everywhere you turn. The microbrewery bandwagon is getting full, but for beer lovers it is a case of the more the merrier. Northern California’s San Jose is one of California’s more recent cities to join the craft beer movement. Until recently the San Jose brewery was Gordon Biersch, which started in nearby Palo Alto in 1988. Hermitage Brewing Company has been in San Jose since 2009 but didn’t have a taproom open to the public until as recent as 2013. Hermitage brews their own small batch beers and is also a contract brewer. 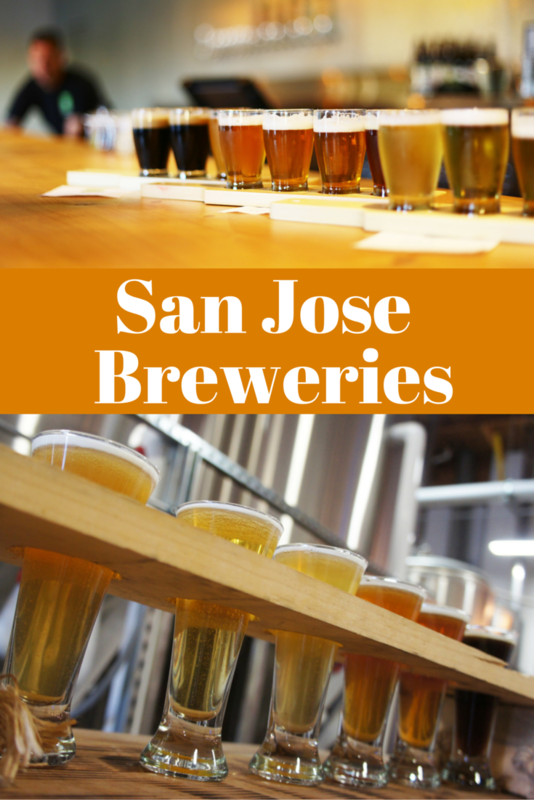 Nowadays San Jose’s brewery options are still limited, but locals and visitors alike now have a few options if they want to visit a microbrewery, have a seat, and enjoy a few local craft beers. During a recent trip, we visited a couple of the breweries in San Jose. Santa Clara Valley Brewing's taproom. Tom Clark, CEO of Santa Clara Valley Brewing, was traveling the west coast with his family and noticed that so many of the places they visited, like San Diego and Portland, had microbreweries around every corner. He wanted the same for San Jose. He joined with partner Steve Donohue and they started brewing beer. In 2013, they contracted with Hermitage Brewing Company and began to create a following for Santa Clara Valley Brewing’s beer. In April 2015, they opened their own San Jose brewery and in June 2015 they opened the doors to their tap room. Tom Clark showing us around the brewery. Santa Clara Valley Brewing’s flagship beer is Electric Tower IPA. The beer is named after San Jose’s electric light tower, a replica of which can now be found in History Park. San Jose’s electric light tower was the brainchild of the San Jose Mercury’s editor J. J. Owen. He wanted one source of light that would illuminate all of downtown at night. The tower was constructed in 1881. While it didn’t completely accomplish its goal, it represented progress. All of SCVB’s beers are named after something local. Another example is the New Almaden Imperial Red, named after the historic town in the foothills south of San Jose where cinnabar was mined. During our visit, there were 11 choices on tap and we got to try them all. They were all good, but there were a few standouts for me. My first sip was of SCVB’s Saison, a porch pounder (I love my new term from our Denver brewery tour) which was lemony and refreshing. The Saison is a collaboration beer with Drake’s Brewing in San Leandro made with coriander blossom and gingerroot. The Dry Creek Blonde Ale had a lot of body for a pale beer and was effervescent. The Peralta Porter had a faint aroma of coffee and a smoky taste. Comparing the Imperial Oatmeal Stout on nitro (left) and CO2 (right). One of my favorite beers at SCVB was the Imperial Oatmeal Stout. They were actually pouring this one from two different taps, a CO2 tap and a nitro tap. The difference between the two was astonishing. The nitro pour was incredibly creamy and smoother. The smaller bubbles not only create a different mouth feel, but also a slightly different flavor. Something to look forward to is the holiday version of SCVB’s oatmeal stout which is currently being aged in whiskey barrels. Imperial Oatmeal Stout aging in whiskey barrels for the holidays. A surprising standout was the Heart’s Delight 2015 sour ale with apricots. Sours can be an acquired taste and I wouldn’t list them in my favorites, but SCVB’s apricot sour was very sour and very good. I’m still not sure if I could drink a full one, but I’d be willing to try. (We’re also wanting to test how it would work in a beer batter for our fish tacos.) SCVB ages their sours for one year in white and red wine barrels and experiments with a different fruit each year. The Santa Clara Valley Brewing tap room is a large and comfortable space in an industrial park. What we noticed as soon as we entered was how welcoming it felt. There are plenty of places to sit. The room has a dark ambiance with wood paneled walls, cement floors, and light fixtures made from growlers. The music was at a level that was pleasant and allowed customers to relax and carry on a conversation. There was also a box of games in the corner, encouraging people to get comfortable and hang out awhile. Strike Brewing Co.'s taproom is in the middle of the working brewery. A few blocks away from SCVB is Strike Brewing Co., which brewed its first beer in 2011. Strike’s taproom, which opened in 2014, has a very different feel. The taproom is located in a warehouse amongst the stainless steel tanks, right in the middle of the working brewery. Partitions are made with wood pallets and guests sit at picnic-style tables painted with the logo or bar-height tables. In the back is a ping-pong table. All of these together make the taproom feel almost like a college dorm. Strike Brewing had seven beers on tap during our visit which ran the spectrum from blonde to porter. Within this diversity was also uniformity as Strike Brewing’s mission is to brew session beers that taste good. Even though the beers were different colors and flavors, they were all easy drinkers. Santa Cruz Classic Dot Blonde Ale. Strike Brewing and all of its beers have baseball-related names because one of Strike’s founders, Drew Ehrlich, was a former Stanford baseball pitcher. My favorite of the lighter-colored beers was the Screwball Blonde Ale, a refreshing beer with a cloudy pale yellow color. My husband’s favorite was the Santa Cruz Classic Dot Blonde Ale, which is also becoming one of Strike’s most popular beers. This session beer was created in collaboration with Santa Cruz Skateboards. Representing the dark beers was Strike’s Pinch-Hitter Porter. As I raised the glass I was struck by the strong coffee aroma. While dark, the porter is more on the brown side than the usual inky black. Strike Brewing was also serving one of their seasonal offerings, Hunt for Oktoberfest Ale. Rather than the usual lager, Strike decided to make its Oktoberfest beer an ale, which is thick and tastes of caramel. To encourage repeat customers, Strike Brewing offers a mug club membership. The mug club’s annual membership includes a personalized Strike Brewing Co. mug which gets parked on their mug wall, one free pour per visit, and a discount on additional beers and merchandise. We’re always excited to see cities jumping on the microbrewery bandwagon since that means more craft beer for craft beer lovers at home and on their travels. The next time you’re in Silicon Valley, check out these breweries in San Jose. Thank you to Santa Clara Valley Brewing and Strike Brewing Co. for hosting our visits to their San Jose breweries and making this post possible. As always, all opinions are my own.